I live with a family of chickens. Well, not literally chickens. I don’t have a mother hen and a bunch of chicks running around. What I meant was that my husband and my children are afraid to eat fish. In my husband’s case he never really ate it as a child, so growing up fish just wasn’t on the menu. I was the same way. And, because I was married to a non-fish eater, I never prepared it. Therefore, my children are reluctant as well. That’s why I buy those frozen packs of individually packed fish fillets. If I want to enjoy some fish on my own, I can. And, I do every once in a while. 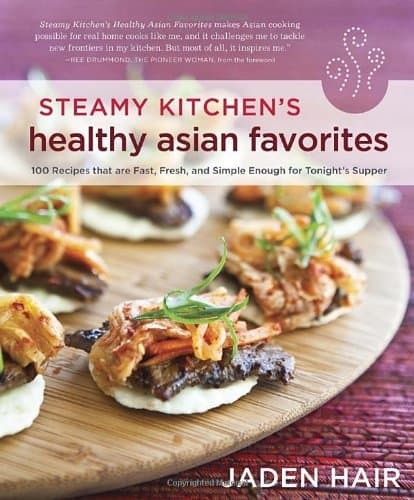 Recently I received a copy of Jaden Hair’s new cookbook Steamy Kitchen’s Healthy Asian Favorites. 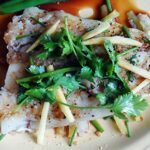 I was thumbing through the pages when I came across page 142 and this flavorful recipe for Chinese-style Parchment Fish. I’ve cooked in parchment before when I made this fabulous Curried Chicken, Peppers & Peas so this method wasn’t completely foreign to me. 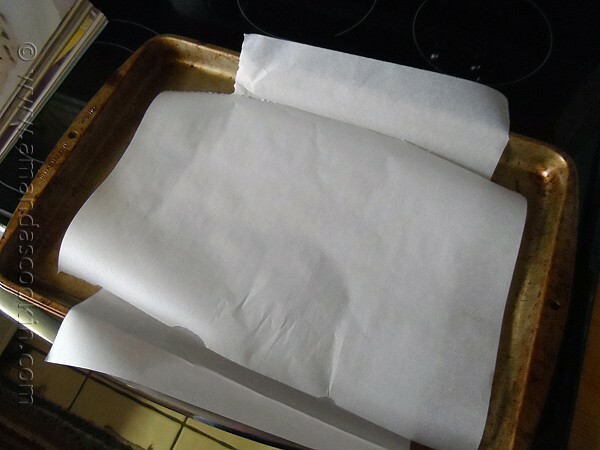 In fact, baking in parchment is pretty popular and is a great way to cut down on the dishes while baking up amazing food. Win/win. Jaden calls this “Chinese-style” fish because she says that traditionally Chinese fish is steamed whole, presented head, tail and all at the table. 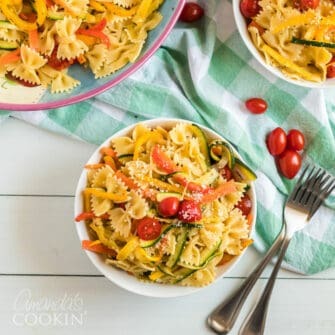 She goes on to say that that it can be quite a messy chore and has adapted this French cooking method (parchment) for quicker meal preparation and easy clean up. She uses delicious Chinese herbs and seasonings, all of which I had in my pantry. I only made slight adjustments to the recipe. I added some fresh chives from my herb garden that were growing out of control, and didn’t have a fresh chile on hand, so I left that out. You can use any white fish you like, I had cod in the freezer. This was really and truly flavorful and gone quickly. In fact, I only made one small filet and wish I had made two! A definite keeper! Related: if you love fish you might want to try this Moqueca (Brazilian fish stew) from Little Ferraro Kitchen. I’ve added it to my list! When you cut the green onions, use only the white part. Cut them in half lengthwise and then cut them in half again. 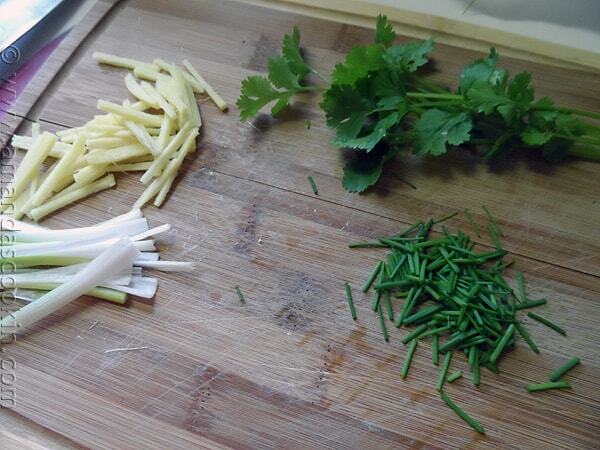 Peel and julienne some fresh ginger, cut some cilantro stalks, and if you like, chop a littler fresh chives. 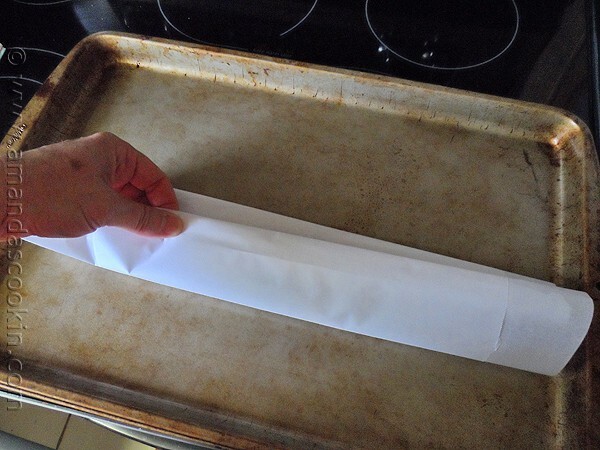 Criss cross some parchment on a baking sheet. 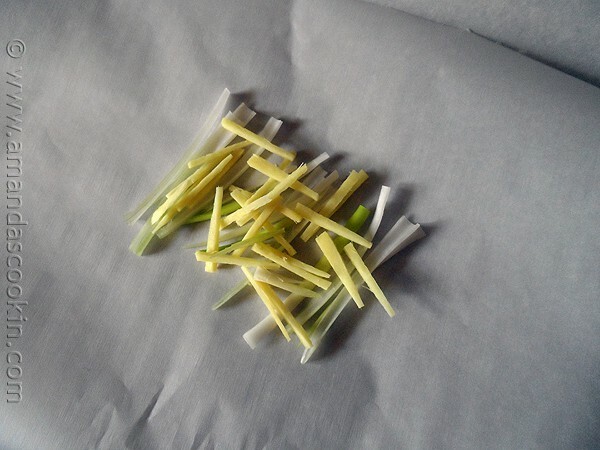 Lay the green onion down on the parchment and cover it with half of the ginger. This will be the bed for your fish. Salt and pepper both sides of the fish and lay it on the bed. Add half of the cilantro to the top of the fish. Rolling up the sides to keep all that goodness inside. Open the top and pour the wine in then close it back up and bake it. 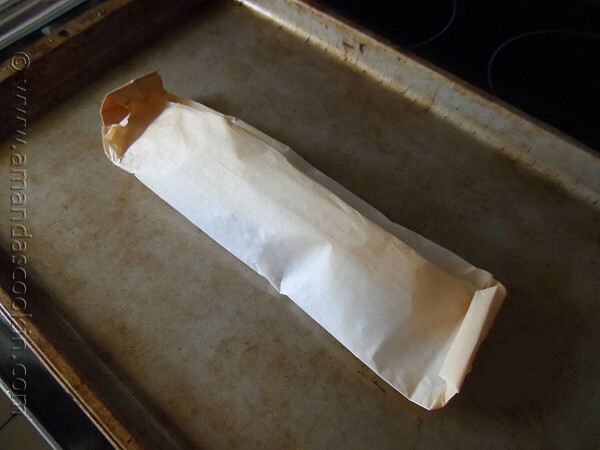 When it comes out of the oven, the parchment will be browned. Open it up carefully remove the cilantro and replace it with the remaining fresh cilantro, as well as the chives and the sauce. Serve! 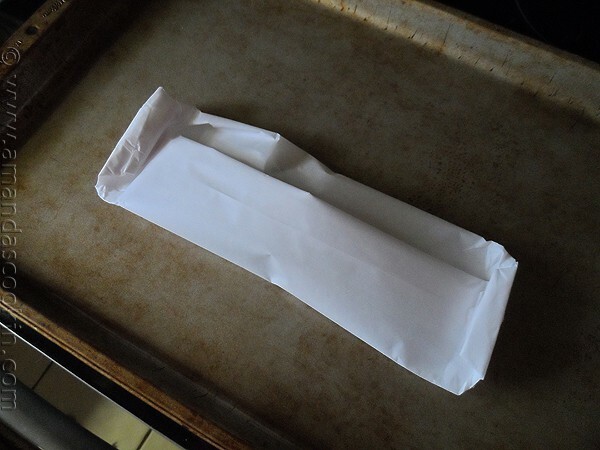 Position parchment paper on baking sheet in the shape of a cross, one on top of the other. 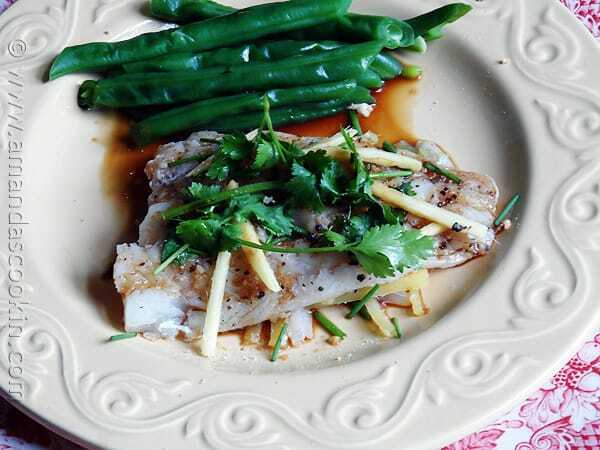 In the center, make a bed for the fish with the green onion and half of the ginger. Season the fish with salt and pepper on both sides and lay it on top of the herb bed. 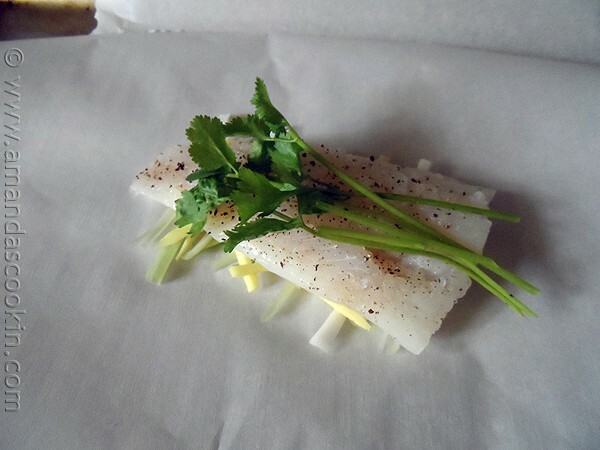 Top the fish with half the cilantro, fold and crimp the parchment into a packet. So that the wine doesn't pour out, carefully reopen the top of the packet, pour in the wine and recrimp tightly. Staple if you wish. 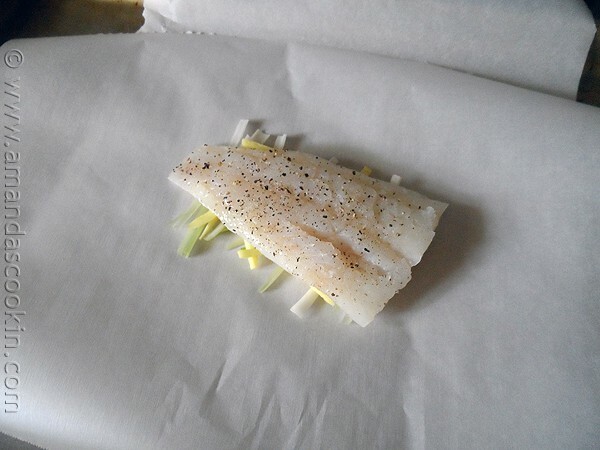 Bake 12-15 minutes, until fish is cooked through and flakes easily with a fork. If you are cooking more than one packet, add one minute to the cooking time for each additional packet. Just before serving, carefully open the packet and discard cilantro on top. Top the fish with fresh dill, remaining cilantro and ginger. 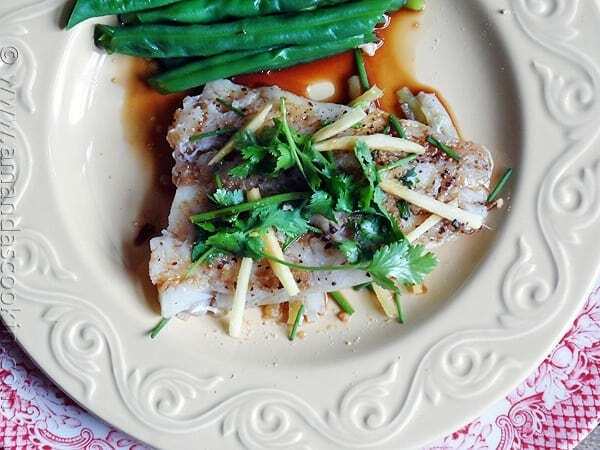 Combine soy sauce, vinegar, sugar and sesame oil and pour over fish. Serve immediately. Great combination of flavors! I occasionally do something in parchment and it always comes out very moist and flavorful. Definitely a great way to bake fish. Looks good! I just made salmon in parchment for dinner last night that had pesto on it. It was really yummy. This looks like a great way to do fish, love it! I’ve always liked Jaden’s recipe – I need to get this book!